The CSI2205D Micro Control Unit auto-ranging Digital Multimeter (DMM) is designed for measuring resistance, capacitance, DC & True RMS AC voltage, DC & True RMS AC current, frequency, duty cycle and temperature, along with the ability to test diodes, transistors and continuity. 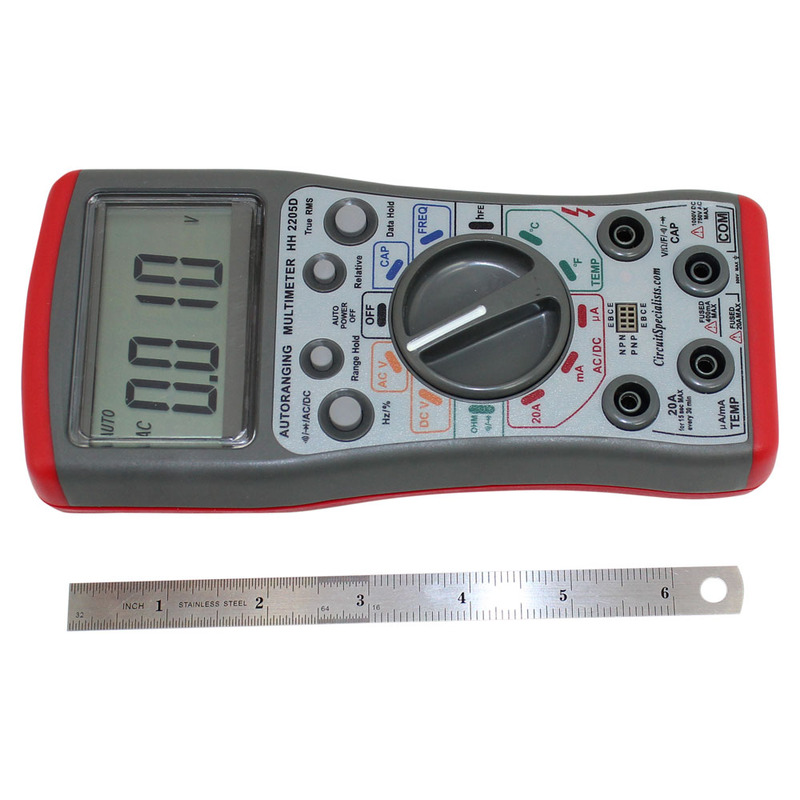 This is an extremely robust design featuring a dual injection casing that provides the end user with a rugged, ergonomic design normally associated with high priced digital multimeters. A special feature included is the Auto Test Lead Input Indication Technology. 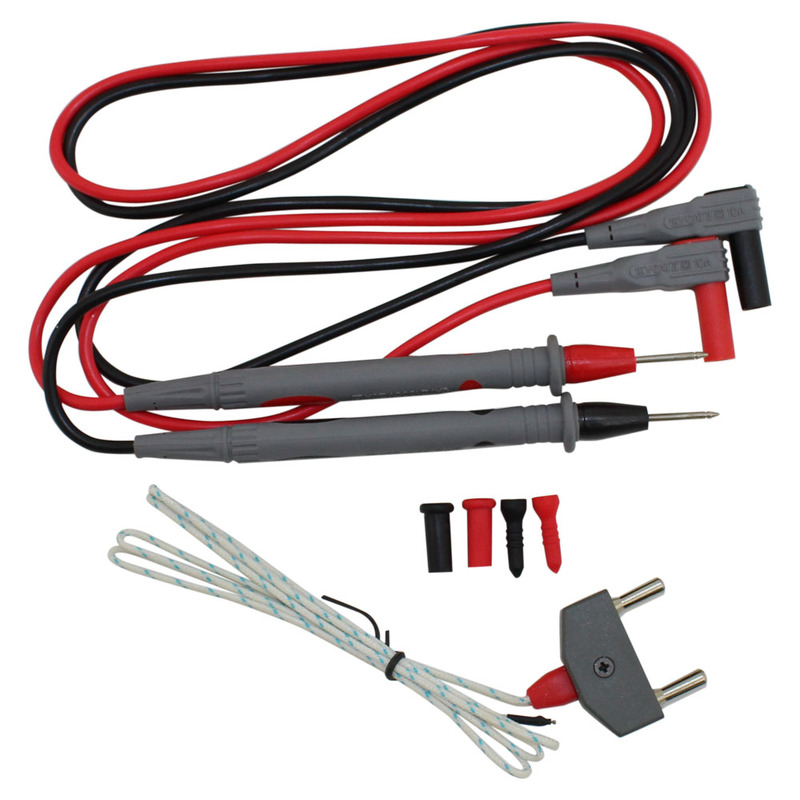 This will ensure that whenever you switch functions on the DMM, the proper positive port LED will light indicating where to plug the red test lead into so that no mistakes can be made by the user. It even goes so far as to give a warning tone if you do plug the lead into the incorrect jack! A very helpful feature for the novice and even for the experienced user who is using the meter in less then ideal lighting conditions. Overall, we find this to be a meter that compares very favorably with much higher priced competitors on the market today! NEW Exclusive Patented ATLII, Auto Test Lead Input Indication Technology. High Accuracy (basic accuracy 0.8%). 3-3/4 Jumbo LCD display 4000 count with symbolic signs. 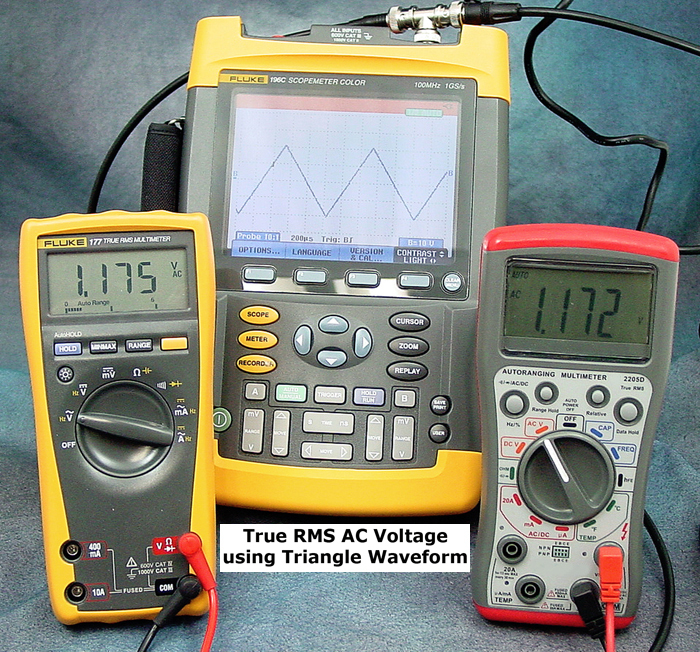 Auto Ranging High Voltage test up to 1000V DC and 750V Trms AC. 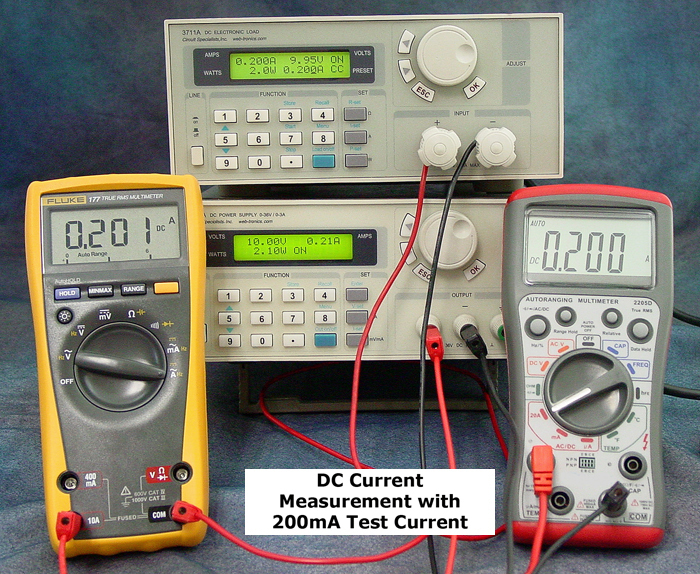 Higher Current test up to 20A.AC/DC. 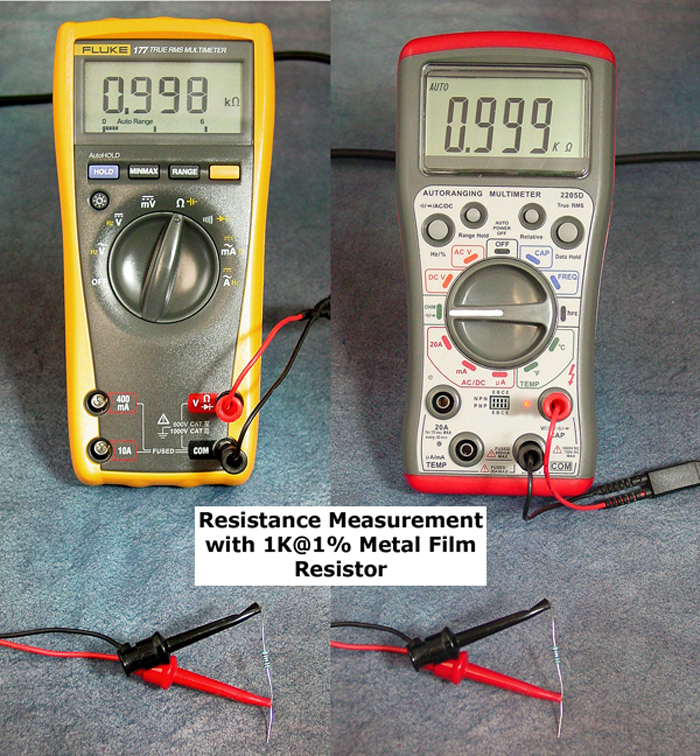 Measure Resistance up to 40M?. 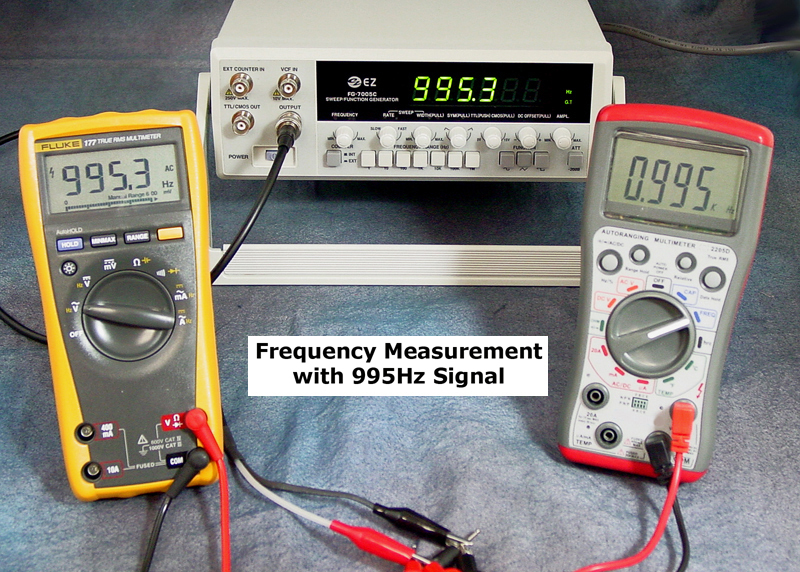 Measure Frequency up to 400kHz. 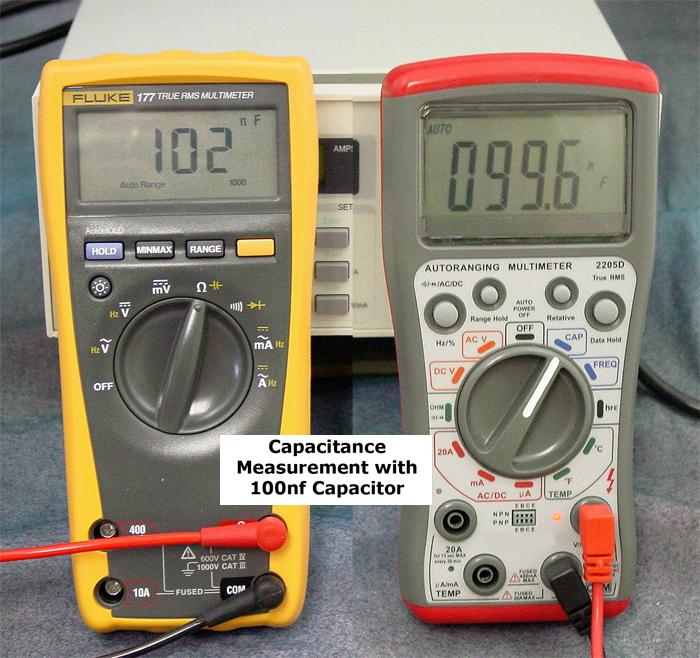 Measure Capacitance up to 100µF. Range Hold, Data Hold and Auto-Off Function. Uses 2 X 1.5V AAA battery. Size: 7.4 X 3.44 X 1.32". 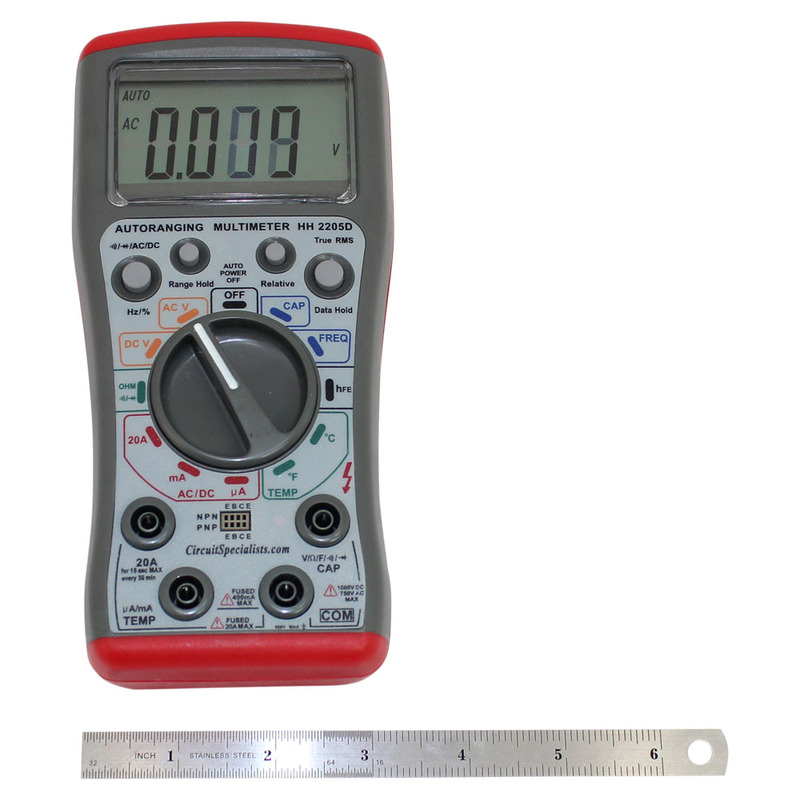 The CSI2205D True RMS digital multimeter multimeter was reviewed with key measurement modes compared side by side with the top name brand digital multimeter with similar features. The Fluke 177 True RMS multimeter was chosen as a representative model industry standard to use as a baseline for the evaluation. Both units are Handheld Auto ranging Digital Multimeters. The CSI2205D meter retails for $59.00 with features rivaling similar meters costing up to four times more. The Fluke DMM used in this analysis, also sold by Circuit Specialists was a brand new unit. The purpose of this comparison is to demonstrate the relative accuracy in key measurement modes between the two products. The CSI2205D is an mCU controlled high accuracy DMM built into a rugged double injection molded casing. While the casing construction is not as robust as the Fluke DMM, the overall feel and the fit & finish of the CSI2205D was satisfactory. The measurements performed were Resistance, Capacitance, frequency, DC voltage, and DC current and true RMS measurement of both sinusoidal and non-sinusoidal waveforms. As can be seen by the photographs comparing it with the Fluke 177 readings, the unit is extremely accurate in all functions measured. The additional functions of diode test, hfe, and temperature were also tested but no comparison was made to the Fluke meter since these functions are typically secondary features of a meter and are not considered high accuracy measurements. One area where the Fluke meter outperformed theCSI2205D was in the resolution available in the DC current readings. The Fluke has a four digit display as opposed to the CSI2205D unit that only displays three digits. Otherwise, the reading displayed on the CSI2205D was essentially accurate when compared to the Fluke 177. 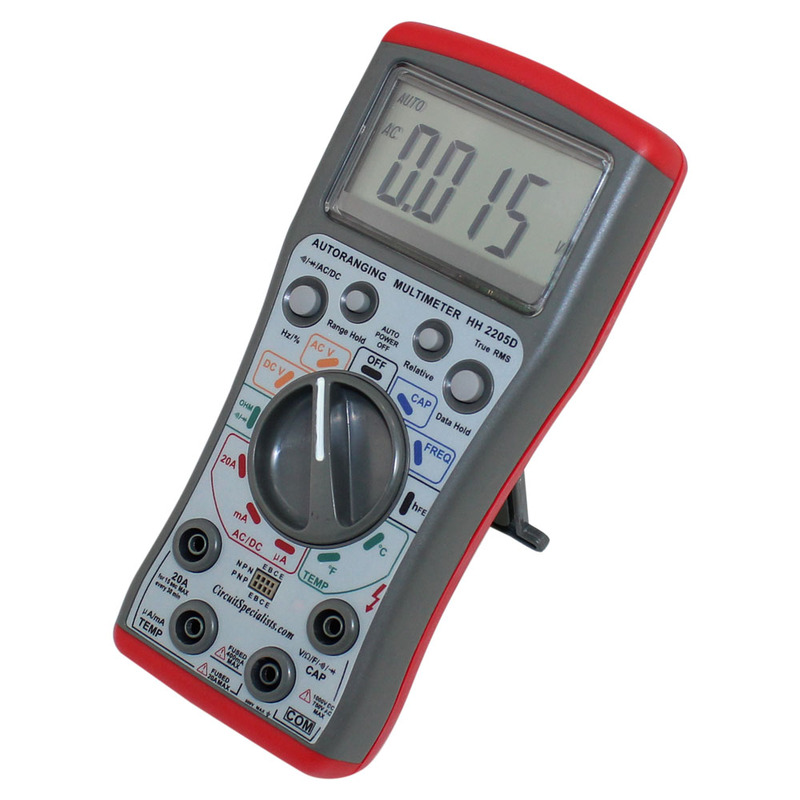 One feature of the Circuit Specialists digital multimeter that is not found on any other meter I have seen is the warning feature when changing the measurement mode from function to function. An LED above the CORRECT positive terminal on the meter will illuminate indicating the correct jack to insert the positive test lead into. If the lead is inserted into the correct jack the LED will extinguish and the meter will function as desired. 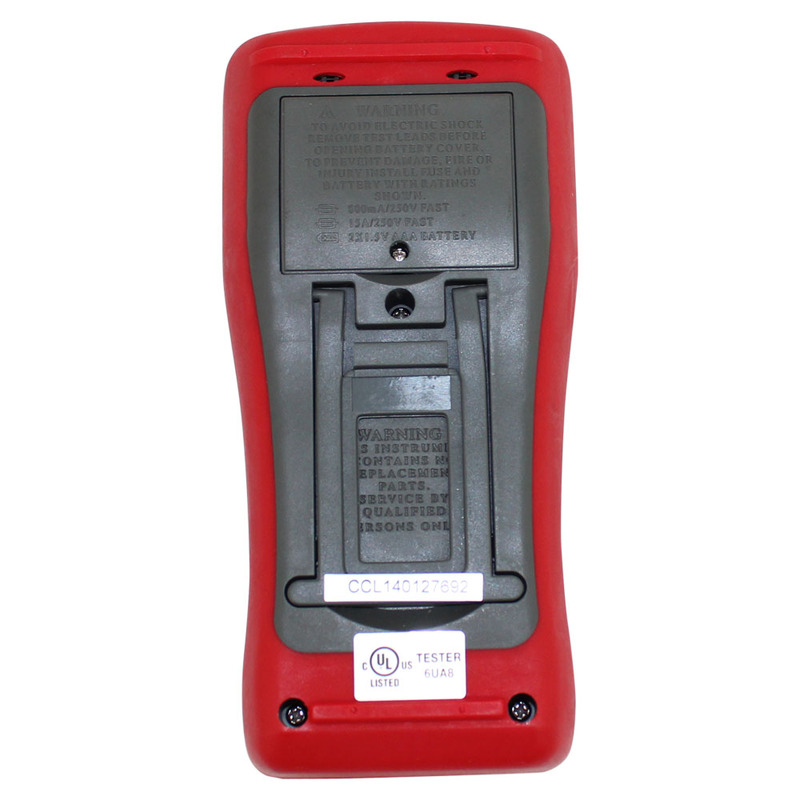 If the test lead is inserted into the WRONG jack, the meter will emit an annoying beep and the LED above the CORRECT jack will blink continuously until the error is corrected. 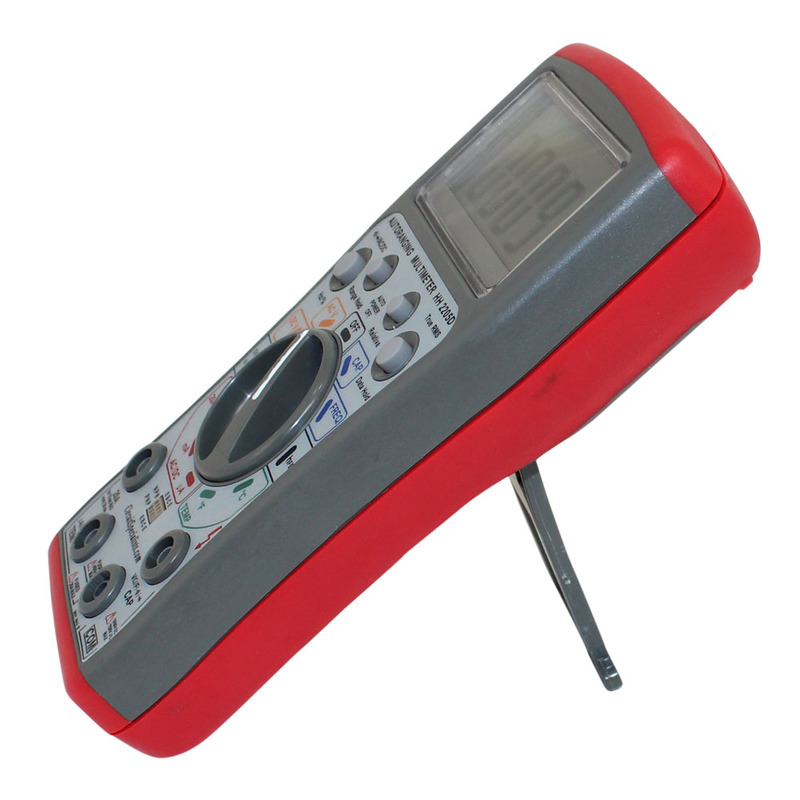 This feature will undoubtedly help to eliminate damage to the digital multimeter or the aggravation of a blown fuse that would occur if you forget to change the positive lead to the correct jack when changing between any mode and current measuring mode. The manufacturer refers to this feature as ALT II Technology and also claims to hold a patent on this design. In any case, it certainly reduces the chances of damaging the DMM due to incorrect jack selection. Definitely a major plus if this DMM is to be used in an educational environment. Besides the overall accuracy of the unit I was impressed with the True RMS readings obtained when measuring various types of waveforms. I measured a sinusoid, a triangle wave, and a square wave. All measurements agreed well with the Fluke meter and with the theoretical calculations for these waveform types. 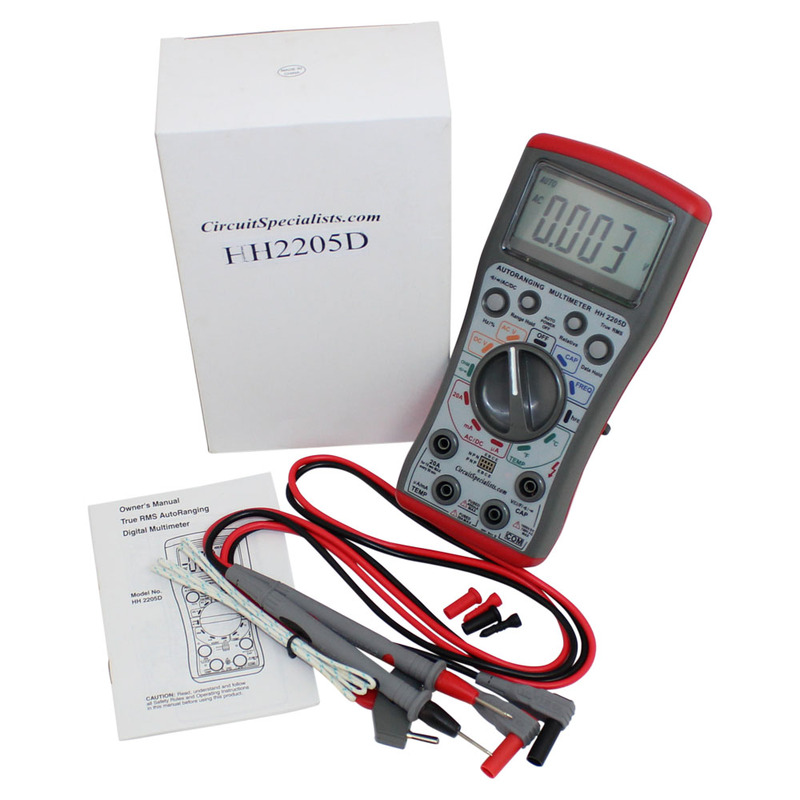 Overall I am very impressed with the CSI2205D True RMS digital multimeter-especially at this price point, and would highly recommend it to electronics enthusiasts, test engineers, technicians, and students.